David Burdeny’s background in architecture and interior design is evident in his photographs, which reveal a strong sense of structure, horizon, balance and space. Whether focused on ordinary spaces or iconic settings, Burdeny’s photographs occupy an artistic middle ground between the physical and the atmospheric, the concrete and the spiritual, the actual and the idealized. 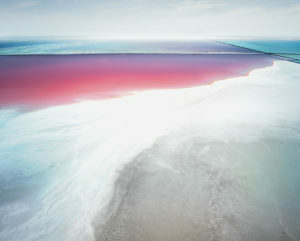 They represent not strictly what he found, but also his personal experience of these enigmatic and luminous locations. the International Nature Photographer of the Year in 2016 for his series Salt. Burdeny is represented by Bau-Xi Gallery in Toronto.